Although we were out on our mountain bikes several times this week (including a ride to the Canmore Nordic Centre, where we easily completed the green loop), it’s been almost a week since our last hike. Since it’s a long weekend here in Alberta, we anticipated many of the premier hiking trails in the Banff area would be quite busy. So we decided to head a little farther afield, to Helen Lake. 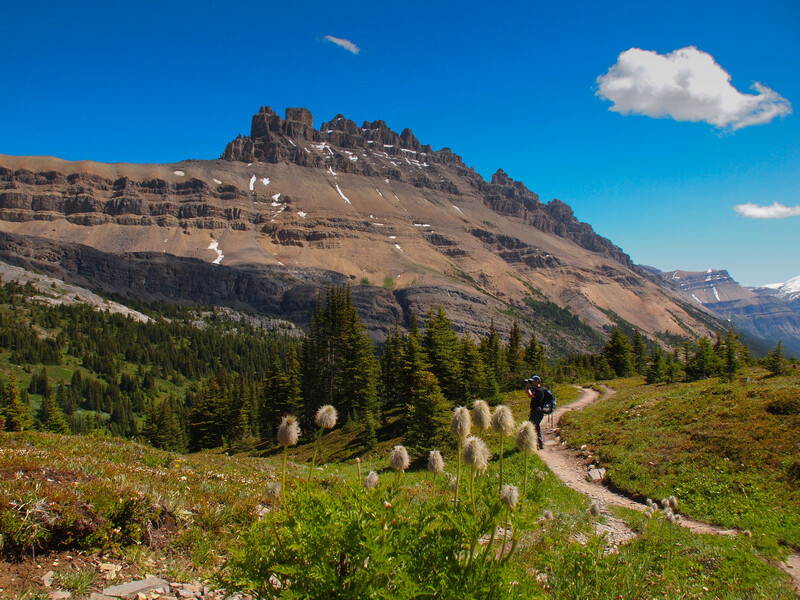 The trailhead is about 33 km northwest of Lake Louise, along Highway 93 north (aka the Icefield Parkway). 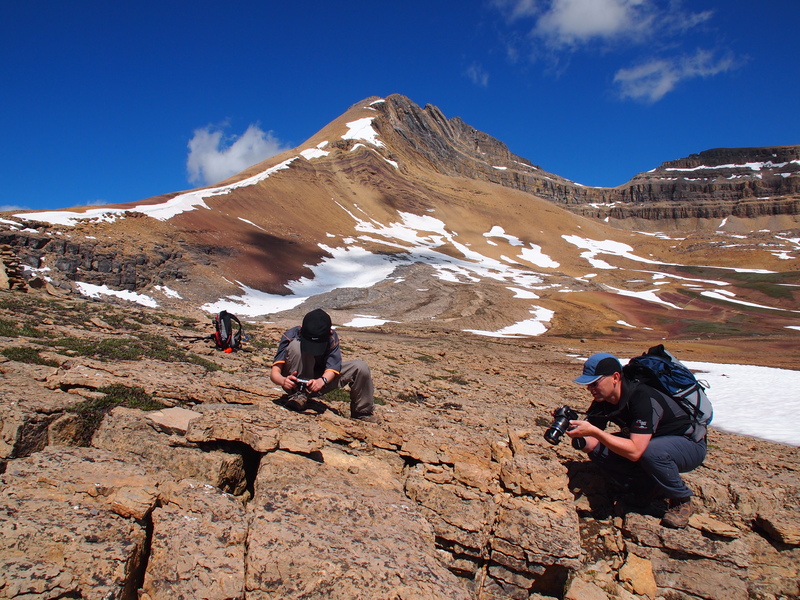 But before pulling into the trailhead parking lot, we stopped just across the road, and the Crowfoot Glacier Viewpoint, to gather the necessary information to log GC2FME7 Crowfoot Glacier Earthcache. This earthcache was created late last year, and we really appreciate the efforts of the cache owner to put the mini-geology lesson together and to obtain the requisite approvals from Parks Canada. When we finally pulled into the trailhead parking area a few minutes before 10 a.m., the lot was about one-quarter full. A couple other groups headed out as we were shrugging on our day packs and setting our trekking poles to the correct lengths, but we soon overtook them as the trail headed up through the forest. Same as last week, our oldest son was soon far ahead, reporting in via walkie-talkie as he made his way up towards the first meadow. We overtook at least 20 hikers over the first three kilometers, despite stopping several times to take photographs of Crowfoot Glacier and Bow Lake. That’s when we knew that even though we’d gone farther afield, we hadn’t gone far enough to escape the long-weekend crowds! Even so, this turned out to be a very enjoyable hike. At about the 3 km mark, we emerged from the forest into an extensive alpine meadow, where mid-season wildflowers were in full bloom. Paintbrush (in many colours), heart-leaved Arnica, pink mountain heather, leafy asters, Elephantheads, alpine buttercups (just about in full bloom), yarrow, common harebells, creeping beardtongue, and golden fleabane provided a colourful backdrop for the views of Dolomite Peak to the east. The alpine meadows showed a wide array of colourful flowers today. These paintbrush were such a deep shade of red that they were almost burgandy. 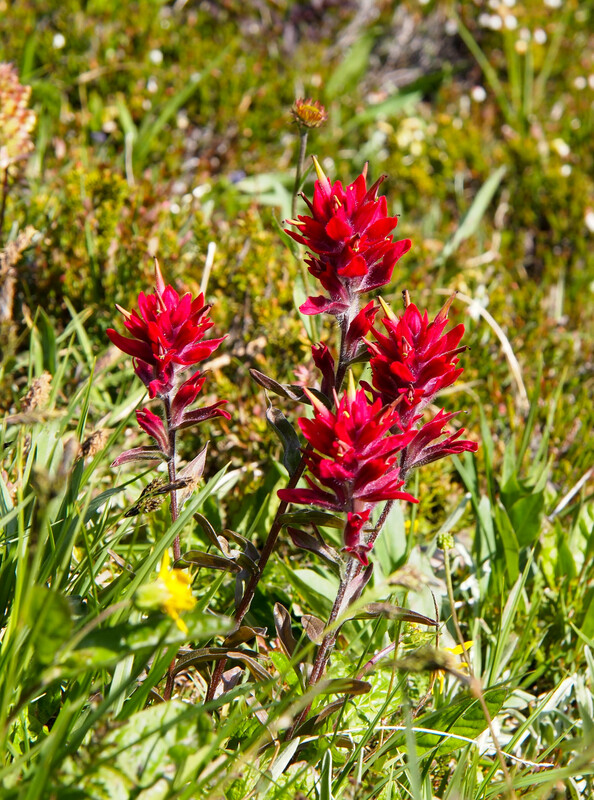 We also spotted true scarlet, salmon, pink and white with pink-centered paintbrush. The second meadow provided amazing views of Dolomite Peak. The first meadow stretched for more than a kilometer and then we lost a bit of elevation as we dipped down around the end of a rockfall. That’s where we spotted our first marmot of the day! It was a little too busy gathering grasses to pose for any pictures, so we appreciated the chance to watch a bevy of marmots in the third meadow, just after we enjoyed the sights and sounds of a multi-stepped waterfall and crossed Helen Creek for the final approach to Helen Lake. About a kilometer from Helen Lake, we finally spotted the waterfall we'd been hearing for several minutes. This creek crossing was straightforward, with plenty of large and comfortably spaced stepping stones. Our oldest son reached Helen Lake about one hour 20 minutes after setting out. He waited about 15 minutes for the rest of us to catch up, and then, after a short discussion about where and when to have lunch, we decided to head up to a saddle below Cirque Peak. After patiently waiting for the rest of the family, our oldest son started out at the back of the pack as we set off from Helen Lake to ascend to the saddle and ridge peak sitting southeast of Cirque Peak. Within minutes, Oldest GeoKid was at the front of the pack, setting a blistering pace for the short climb. Although we counted more than a dozen creek crossings and did our best to avoid all the muddy sections on the way up to Helen Lake, there was nothing we could do to avoid the deep mud on the trail paralleling the lake shore. So we started up the steep grade to the saddle with messy boots! Mrs. GeoK really didn’t enjoy a few short sections of this ascent – very steep and loose…the sort of terrain that causes her to grasp both trekking poles in one hand so that her other hand can stay in contact with adjacent rocks! As soon as we topped the saddle, it was like we were suddenly in the middle of the mountain deserts of Tibet, which we visited in February. There were packed snow patches against rolling brown hills, made up of sandy sediments eroded off the shoulders of Cirque Peak. As we stopped to take in the sense of the place, our oldest son spotted another hoary marmot and we spent a good 10 or 15 minutes taking photographs and watching the little fellow bask in the sun. 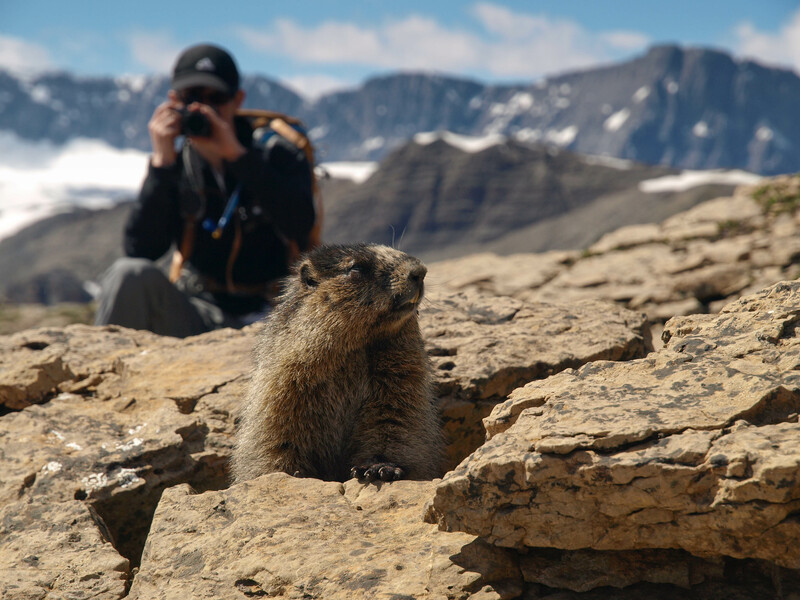 This hoary marmot patiently posed for several moments, while our oldest son captured several very good close-ups. Mr. GeoK managed to get them both in this shot! The marmot eventually tired of posing, and ducked into some nearby rocks. Youngest GeoKid and Mr. GeoK waited patiently for another chance to take some close-up pictures. Cirque Peak is in the background. We decided to head southeast along the ridge, towards Dolomite Peak, in search of a sheltered spot for lunch. Depending on the direction we looked, the mountains and rocks were either grey or brown…there must be a geology lesson in there somewhere. (NOTE: we’ve seen the same juxtaposition at Little Highwood Pass and from Grizzly Col in Kananaskis Country). The ground was absolutely saturated with recent snow melt, and every step we took left an indentation that rapidly filled with water. We soon found a large rock slab on the leeward side of the ridge, and settled in to enjoy our packed lunch while we studied the landscape. Pulling out our Gem Trek map for Bow Lake and Saskatchewan Crossing, we soon discovered that we were looking northeast, to Watermelon Peak and Bobac Mountain. Mr. and Mrs. GeoK ventured further along the ridge, and discovered that Katherine Lake stretches out along the bottom of the cliff topped by Dolomite Peak. Mr. and Mrs. GeoK took turns walking out along the ridge extending east from the saddle below Cirque Peak. Mr. GeoK knitted a couple of pictures together to create this panorama shot featuring Cirque Peak (center). After relaxing for more than an hour up on the ridge, we stowed the remains of our lunch and headed back to Helen Lake. The climb up to the saddle was extremely busy, with about a dozen people on the way up and another 20 or so at the lake. We finally gave up waiting for everyone to reach the top and started down, stepping off the trail as needed to allow others to pass. We continued to encounter more hikers, all the way back to the parking area. The last groups left the parking area shortly before three pm, and they would have been able to make it to the lake and back without any concerns about getting caught as the sun went down. We estimate well over 100 people hiked to Helen Lake today. But we’re pretty sure that only a handful spotted the mama ptarmigan and her chicks just off the trail near the viewpoint overlooking Bow Lake and across to Crowfoot Glacier! That makes two hikes in a row where we’ve spotted a ptarmigan family. 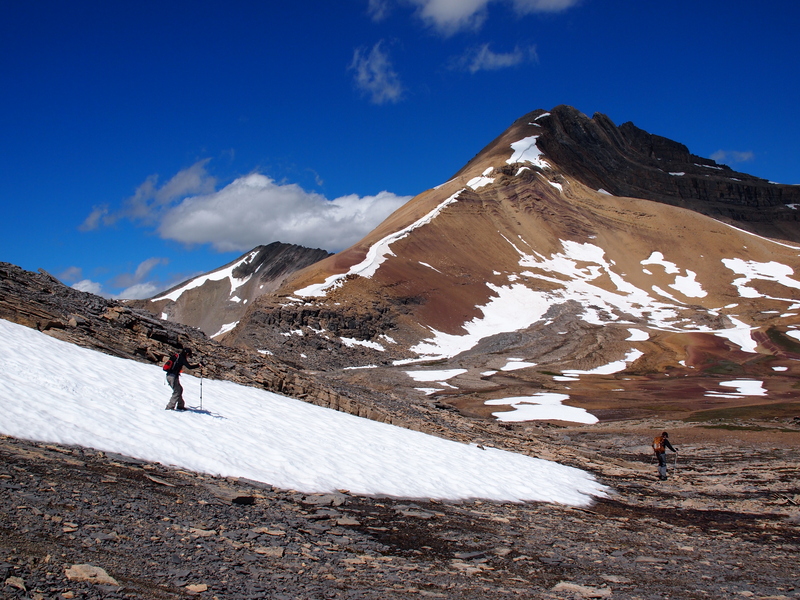 Total return distance to Helen Lake is approximately 12 km, with approximately 450 meters net elevation gain. We hiked 15.2 km, gaining 560 meters (net). All-in-all, this is a great alpine meadow hike, with an abundance of wildflowers and plenty of opportunities to photograph marmots. 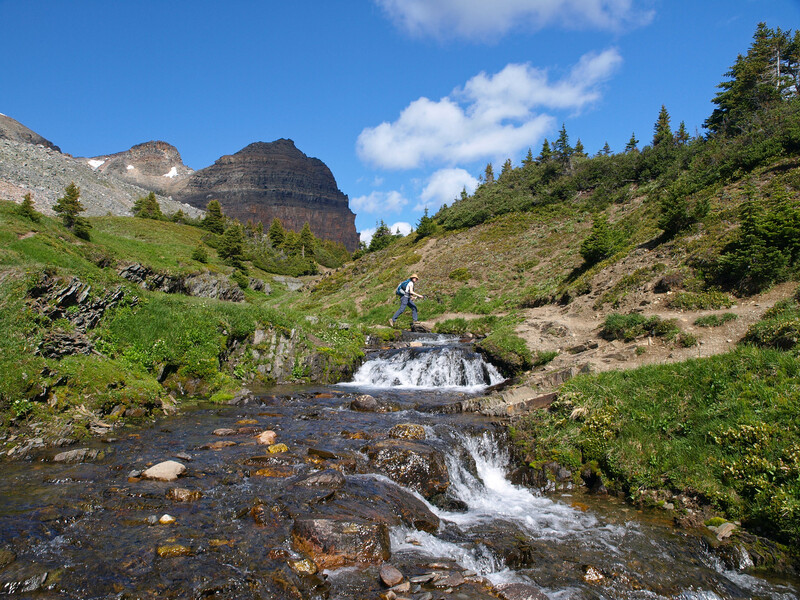 We’ve added Helen Lake to our list of “hikes to repeat”. But come fall, Healy Pass will be a better bet, due to the abundance of larch in the surrounding valleys. Thankyou for this grand post, I am glad I found this website on yahoo. Another amazing looking hike. I need to get myself into a better frame of mind and such to be able to pull off a hike like this. I think what really grabs me is the photos you post.